PIZZA PIZZA PIZZA The ultimate comfort food for all of us. 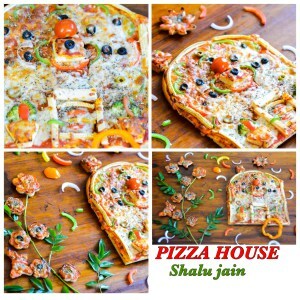 Just the name of Pizza brings a smile on everybody’s face n twinkle in the eyes n not to forget grumbling in the stomach. Making Pizza base at home was a totally alien thing for me. It was not at all my thing. But I started out with making Garlic bread n then the bug took its course. 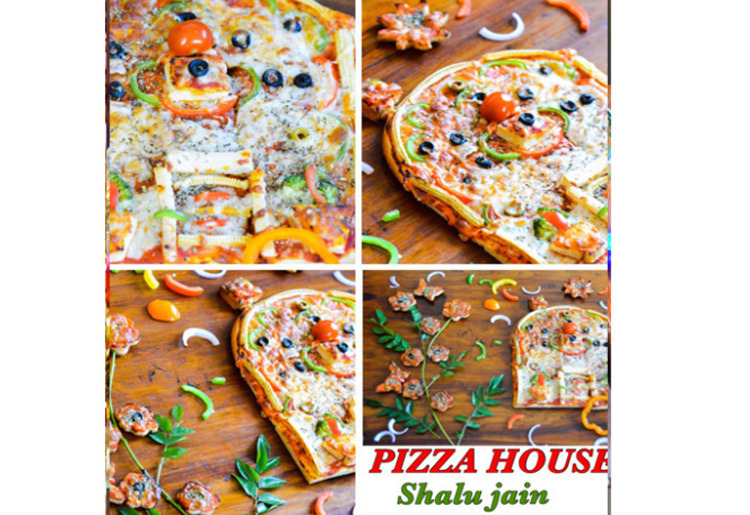 Thought of making Pizza base also. The best compliment came from my son”Mom, yours is far more yummy n tasty then California Pizza Kitchen(His fav Pizza Joint). To make the base bit towards healthier side I’ve used All Purpose Flour n Whole wheat Flour in the ratio of 1:1. 3: TOPPINGS: With Pizza you can always feel free to choose the toppings. Theres no hard n fast rule for how to cut veggies n how much to use them. You can increase or decrease the toppings according to your choice. 🍞Take lukewarm water, add sugar, yeast and mix well. 🍞Combine the maida,atta, salt, 1.5 tbsp olive oil in a deep bowl and mix well. 🍞Add the yeast water at the center and knead into a smooth dough. 🍞Knead for atleast 10 min, its important to get a soft sticky dough, add little water if required. 🍞Form a ball, grease it with olive oil and keep it covered at a warm place for about 1-2 hours. 🍞The dough will rise well almost double to its original size. Punch it. 🍞Sprinkle some maida on a clean surface n take 1/4th of the dough and roll it out to almost 6″ big round shape. 🍞Prick with a fork to release the air. 🍕Top it with your choice of toppings. 🍕Sprinkle some more mozzarella cheese. 🍕Bake in a Preheated oven @200 degrees centigrade for 15-20 min or till golden brown.